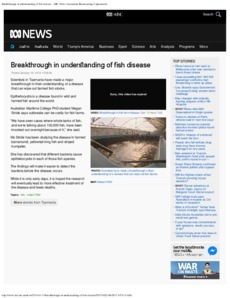 Scientists in Tasmania have made a major breakthrough in their understanding of a disease that can wipe out farmed fish stocks. Epitheliocystis is a disease found in wild and farmed fish around the world. Australian Maritime College PhD student Megan Stride says outbreaks can be costly for fish farms. "We have seen cases where whole tanks of fish, and we're talking about 100,000 fish, have been knocked out overnight because of it," she said. Ms Stride has been studying the disease in farmed barramundi, yellowtail king fish and striped trumpeter. She has discovered that different bacteria cause epitheliocystis in each of those fish species. The findings will make it easier to detect the bacteria before the disease occurs. While it is only early days, it is hoped the research will eventually lead to more effective treatment of the disease and fewer deaths.